More than one year has passed since Russia launched its military campaign in Syria. During those thirteen months, the Russians’ relations with the key players in the Middle East have experienced lots of ups and downs. With the Turks, they were especially checkered. In such an erratic game, the Kremlin needs certain “stabilizers” and Israel is one of them. Since his first visit to Moscow in Sept 2015 (a few days before the start of Russia’s air campaign in Syria), Israeli Prime Minister Benjamin Netanyahu has met and contacted Russian President Vladimir Putin for a dozen times. During his visit to Moscow, Netanyahu was accompanied by the Chief of the General Staff and the chiefs of the Military Intelligence and the National Security Council. The moment was really crucial for Syria. Seven months later, on Apr 21, 2016, Netanyahu and Putin met in Moscow again. Before that, on Nov 30, 2015, they had a meeting in Paris in the framework of a UN climate conference. There Netanyahu confirmed Israel’s commitment to cooperate with Russia in Syria. However, more and more Jewish politicians are warning that Russia’s presence in Syria may tie the Israelis’ hands. They say that the Kremlin has imposed its policy on Netanyahu and are concerned that the Russians’ S-300 and S-400 systems in Syria are controlling all of Israel’s territory, except for the Ovda air base in the south of the country. According to experts, the Russians’ air defense systems at Khmeimim are controlling most of the air in Turkey, Israel, Lebanon and Jordan and even the north and the east of Iraq, while their sea force in Syria, particularly, their Admiral Kuznetsov aircraft carrier, constitutes a serious challenge for the Middle Eastern elites and their western partners. The Israeli air forces are not used to such high activity even if it is shown by a partner. They are used to preventing any slightest threat to their security. In Syria and Lebanon, where their enemy is the pro-Iranian Hezbollah, they are regularly attacking arms convoys moving from Damascus to Beirut as they cannot let any arms get to the Lebanese Shias. This system is working like clockwork and will hardly be reviewed. Despite certain problems, the Israeli Defense Army is effectively co-existing with the Russian air force in the Syrian city of Latakia. The sides are applying a special mechanism in Syria. Its key goal is to prevent clashes in the Syrian air. The sides are not, however, planning any specific joint anti-terror activities yet. One of the factors that are keeping them from doing this is Israel’s antagonism with Iran. 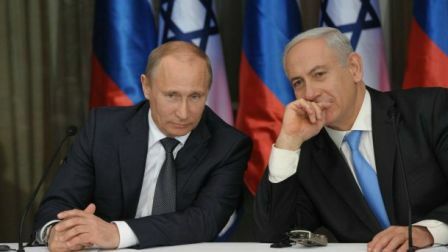 The principle of the Russian-Israeli cooperation is not to harm the partner and to respect its interests. As far as security is concerned, the Israelis have no grounds for suspecting the Russians of plotting anything against them. On the contrary, the Russian military presence in the region is a guarantee of security for their eastern and northern borders. Quite active in the Syrian province of Deraa this spring, ISIL’s branch, the Yarmouk Martyrs Brigade, is showing no more activity due to Russia’s air strikes. The Israelis are keeping a keen eye on Hezbollah, the Shia volunteers in Iraq and the Iranian Islamic Revolution Guards in the southern Syrian provinces of Deraa and Quneitra. The Russians insist that the al-Assad troops should have full control over the southern and southeastern Syrian provinces bordering on Israel. This may mean that they expect the Israelis to help them prevent any other military presence in those provinces. The deal is that if the Israelis want to see no more Hezbollah and Iranian forces in Syria, they should undertake symmetric measures, that is, help the Russians to drive all “moderately terrorist” anti-Assad groups from the south of Syria. Almost the same is going on at the other section of the Israeli border, near the Syrian city of Al-Zabadani, where the Assad troops have neutralized Jabhat Fatah al-Sham (former Jabhat al-Nusra – banned in Russia). In Israel, many people believe that their key enemy is not ISIL or the Syrian Al-Qaeda but the Lebanese Hezbollah. Today, the Lebanese Shias are focused on Syria, but nobody, including the Russians, can force them to make friends with the Israelis as war against Zionism is the core of their ideology. On the other hand, Russia’s presence in the area can prevent Hezbollah from resuming large-scale combat activities against Israel. Russia’s anti-terror activities in the Middle East should inspire Israel not only in Syria but also in Sinai, where ISIL has the Wilayat Sinai group. Though Russia has no military bases in Egypt and will hardly have any in near future, according to the local authorities, the sides are actively cooperating against terrorism. It may be just a coincidence but the final round of the last Egyptian-Russian military exercise in Alexandria (Defenders of Friendship 2016, Oct 15-26, 2016) coincided with Egypt’s successful campaign in the north of Sinai, very close to the Palestinian Gaza, where local fighters keep disturbing the Israeli defense army. On Oct 25, the Egyptians liberated from Wilayat Siani the village of Balaa, one of ISIL’s key footholds in Sinai. There they found six Jihadi strongholds and tunnels leading to Gaza. Though obviously anxious about the appearance of the “Russian bear” in the Middle East, the Israelis are much more concerned for the growing Russian-U.S. confrontation. Right after the failure of the Geneva agreements on Syria, Israel’s former Ambassador to the UN Ron Prosor told the Jerusalem Post that Israel was facing a dangerous choice between the need to cooperate with Russia in Syria and the need to continue its strategic partnership with the United States. All this may have quite uncomfortable consequences for the country.